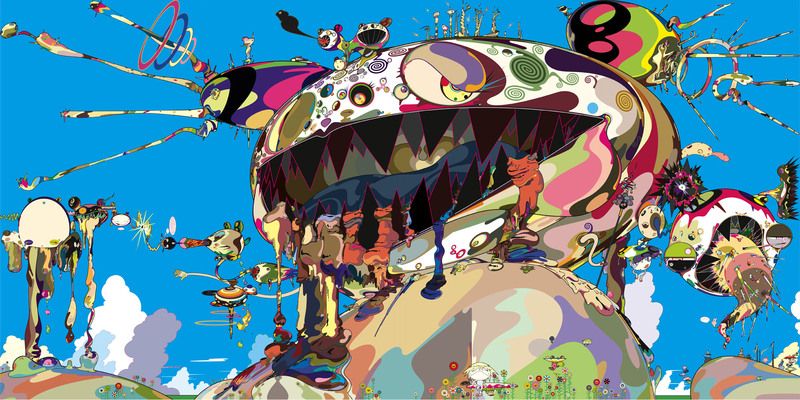 “Known for his collaborations with pop icon Kanye West and fashion house Louis Vuitton, and for vibrant anime-inspired characters, Japanese artist Takashi Murakami (b. 1962) has blurred the boundaries throughout his career between high and low culture, ancient and modern, East and West. The MCA is proud to present a major retrospective of his paintings, featuring fifty works that span three decades of his career, from the artist’s earliest mature works—many of which are being shown in North America for the first time—to his recent, monumentally scaled paintings. The exhibition, titled Takashi Murakami: The Octopus Eats Its Own Leg, shows how Murakami’s art is rooted in traditions of Japanese painting and folklore, and highlights the artist’s careful attention to craft and materials. It also showcases the artist’s astute eye for the contemporary influences of globalization, media culture, the continued threats of nuclear power. Takashi Murakami: The Octopus Eats Its Own Leg is organized by the Museum of Contemporary Art Chicago and is curated by the MCA’s James W. Alsdorf Chief Curator Michael Darling. The exhibition is presented in the Griffin Galleries of Contemporary Art on the museum’s fourth floor. To find this text and more information on the exhibition, please go to the Museum of Contemporary Art Chicago website. Takashi Murakami: The Octopus Eats Its Own Leg will run until Sept.24, 2017.